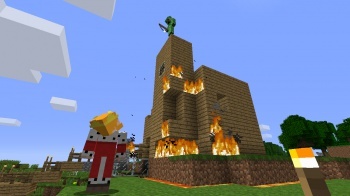 Frequent updates and DLC have helped keep Minecraft downloads steady. Minecraft has enjoyed great success in its move from PC to console, achieving a million sales just a few days after its Xbox Live Arcade release. The downloadable title has continued to dominate, and creator Markus "Notch" Persson announced that Minecraft has now surpassed three million XBLA sales. Just as impressively, Minecraft has been the best-selling XBLA game since it was released in May, beating out titles like Trials Evolution, The Walking Dead, and Quantum Conundrum. It's currently second only to Call of Duty: Modern Warfare 3 in Xbox Live activity. The game has been continually supported by its developers, with last week's update 1.73 adding lots of new content to the game. Since Microsoft's Summer of Arcade just kicked off this week, it will be interesting to see if Minecraft can beat the games in the annual promotion and come out on top again next month. If the game continues to be supported by frequent updates, free DLC, and a bustling online community, it should have no problem carrying on its remarkable run.